A final story from the main Hasbro Transformers day over at the Times Center in New York City, where Toy Fair 2018 is still taking place, is the group interview with the Transformers brand team - including infamous names like John Warden and Ben Montano - which our Twincaster podcaster megatronus was present for and recorded in full! The team took questions from a varied assortment of podcasters, fansites, media sites, many of whom we've also collaborated before, on topics such as Masterpiece toys, the relationship with IDW comics, exclusives, the aesthetic of Cyberverse versus what we might see in War for Cybertron, the possibility of Unicron in a crowdfunded effort, the Bumblebee movie and its toyline, and more. We've highlighted below the questions and responses, including the more trivial and brief, for your perusal - take a read, join the discussion, and let us know what you think! Would love to do that, more MP figures to talk about later in the year, but we do want to balance out the factions. Difference between MPM and Studio Series, in terms of character selection in particular? Global accessibility with Studio Series so as many as possible, MPM is more selective by its nature. Trying to catch a new generation of grown kids too. Attempt to create entirely new toys for this demographic, and have fun with the line later down the road. Bumblebee movie shift affecting the line? Not in release (April 2018), they were supposed to come out together but only some characters have been moved later to coincide with June release. Studio Series collection will host the movie line, but not intended as a catch-all (Thundercracker an exception). Robot modes are scale-accurate, fit a collector shelf, cautious about the numbering system, a narrative woven into it, including backgrounds and cut-outs. It helps and invites new fans into the franchise, casual fans and kids. Trilogy invites to speculate, not lead to an ecosystem – it’s a storytelling universe, as per Hasbro blueprint. 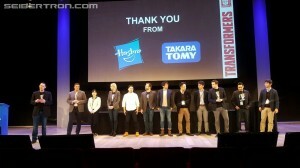 Comments on unification of Takara Tomy and Hasbro? The relationship and cooperation has always been there, this just allows for bringing multiple fandom factions – allowing things like Movie Masterpiece and Takara Tomy Masterpiece lines to be accessible to everyone. Cooperation is key, and building on the passions of both teams, in a very genuine way. Masterpiece continuing after the MPM line? How is Toys R Us situation affecting Hasbro Transformers? Not much of a comment, though Studio Series Thundercracker is a TRU exclusive. We hope to continue partnership. Fan-vote: is there an IDW influence, and what is the Hasbro-IDW relationship continuing? Fans are voting on a pair, not on singles. Yes, the pairings are inspired by elements of IDW, but each can fill in blanks in the toyline in different ways, that those guys can fill them. Fans have a way of organically to play and work in the battleground story. There is intentional conversations, pairings have love/hate elements, and may jar with some. Do pairings have a gimmick? Are they new molds? No. War for Cybertron line may include some previous molds, but intention is to give good representation of the characters. Fans are just voting on the idea of which character will best fit a toy. How are changes with movie plans (alleged reboot of film franchise) affecting toyline? We’re always part of the conversation as partners, but we’re focusing on Bumblebee right now. Lots of toy concepts, lots of Cyberverse, Studio Series, War for Cybertron – we’re just pausing on the movieverse, in no way distracting us. Bumblebee film will hopefully show what we can do collectively. Any bets with Star Wars team on who will do best? Hoping on parents bringing kids to the movies, that’s all. Travis Knight did grow up with G1 like I did [John Warden], so we’re expecting a new fan experience. Cyberverse: hard G1 inspiration reason rather than RID? Female Decepticon make its way in other aspects of the brand? Definitely yes on the latter, Shadow Striker in the series. Aesthetic is aimed to engage all generations, for robot mode at least, a currently fragmented fandom interest (BW, G1, etc) – unification of brand, of lines, of generations of fans. Opening up a dialogue and viewership, which is definitely not a G1 story, it starts in current day but there is an element of comfort for parents and older fans. Authentics will continue, they’re not tied to any story or fiction – just classic characters for a casual shopper, grandma buying ‘an Optimus’ or you just want ‘a Megatron’. Only TRU Thundercracker announced for now, but we do have more lined up for the year. HasLab UNICRON?! So we discuss, they listen, woo! What the F???? is a Haslab? It's their new crowd sourcing platform, from the details I imagine it's a bit like lego ideas. Now, it's official. There will be no additional waves to PotP, we've seen all the regular releases. kurthy wrote: Now, it's official. There will be no additional waves to PotP, we've seen all the regular releases. If it’s about Cybertronian alt-modes then a vote for Wheeljack will probably get us his van alt-mode from episode 1 of the G1 cartoon. Seriously all I want is 3 Tetra-jet Rainmakers, Bumblebee and Wheeljack’s alt-forms and Straxus’s flying gun mode from the comics. Ferak would be nice too. I got customs of 3rd party Tetra-jets as the Rainmakers already and “Skiff” I believe he’s called, but I still want the official figs. i thought there was going to be a quick switch figure. haslab unicron? HEll yes. But yes to earlier comments about removable head. should also have space inside to double as a playset to recreate movie scenes. also to actually have a transformers playset that transformers can be INSIDE. Also yes to comments about being at least double titan class size! Get some orson wells sound clips and lights in there too. light up eyes, abs, possibly even glowy bits in planet mode ala when we first see unicron in the movie. I would not only back this but a primus! Also, ark, nemesis(g1 version not prime/fall of cybertron), axalon, and darkside ships! also agree with what about horrorcons, headmaster jr.s, the second duocon, targetmaster autobots, and powermasters and SCORPONOK!! finish the g1 cast please, we came this far! griftimus prime wrote: i thought there was going to be a quick switch figure. He's not a box set. "We are wrapping up current IDW continuities this year, Unicron is coming to devour everybody. The intention is to continue after that, whatever comes next. Towards end of year we should know more, but we will collaborate on more stories." What?! Unless I missed an earlier announcement, this is huge (and hugely disappointing) news! We're talking about literally the longest-running TF continuity of all time -- and I would argue the best one as well. Yes, it is the end. All the comics will end with UNICRON. Then the Universe will start over pre-Earth in the Way for Cybertron. Targetmaster Kup wrote: Yes, it is the end. All the comics will end with UNICRON. Then the Universe will start over pre-Earth in the Way for Cybertron. Though I could see them during the wfc tie-ins as flashbacks or its own miniseries rather than an ongoing...unless they are planning to just do miniseries but I guess we'll see. I think the entire Hasbroverse is rebooting, if I'm not mistaken. Welp, this all sounds like a huge jumping off point to me. The post-reboot books will have to look amazing to keep me buying. What a waste.